Janis Lane, president of the Central Mississippi Tea Party, said conservatives want America to return to its roots of "limited government, free markets and fiscal responsibility." This photo is Copyright Jackson Free Press. Any use without express permission is a copyright violation. Photo by Virginia Schreiber. Ever heard the expression "Where you have two rabbis, you have three opinions"? It's kind of the same thing with members of the Tea Party. Some people who align themselves with the movement that congealed in 2009 and 2010 profess to be political middle-of-the-roaders with allegiances to no party, while others are dyed-in-the-wool cultural conservatives. Nationally, the Tea Party takes credit for giving Republicans control of the U.S. House of Representatives. Closer to home, the Mississippi Tea Party claimed victory when Phil Bryant became the state's first "Tea Party governor" last fall. Given the party's influence, we recently met with Central Mississippi Tea Party president Janis Lane, a retired marketing manager who resides in Byram, along with Mark Mayfield, a real estate attorney who lives in Ridgeland, and Kim Wade, a Nation of Islam member-turned conservative radio talk host, to talk about Mississippi politics, 2012 presidential race and America's wrong turns. Are Tea Partiers still outraged? Kim Wade: When you say you saw this (outrage) at the beginning, are you sure you saw it or did you just read reports? So much of that stuff, we believe if there were any indications of (in on) posters and flyers and banners, they were brought in by instigators. I remember those early town-hall meetings on the Affordable Care Act. People were pretty fired up. Janis Lane: At the time, we were facing the people making these laws that we did not support, and when we were in those town-hall meetings, we're speaking to our representatives. ... We may be members of a Tea Party outside, but we're there as individuals to confront that lawmaker with the very poor decisions he is making or she is making and that is our right as citizens of this country. ... We have taken the wrong path, and it's been on the wrong path for many years now. This is not something new. Mark Mayfield: It's not political, either. It's not Republican or Democrat(ic). It's a wrong turn. Our righteous indignation is against both parties. So is the Central Mississippi Tea Party primarily interested in state politics? Lane: Last year we were interested in state politics because that was the focus. This year, we have a national election, and we are interested in who the next president will be, who the next president will choose as his running mate, who the next president will choose as his cabinet members. Kim Wade, Janis Lane, and Mark Mayfield sit down and chat with JFP reporter R.L. Nave. How would you like federal candidates to engage the Central Mississippi Tea Party? Mayfield: We think conservative constitutional principles have worked for the last 200-plus years in America, and they have provided the most opportunity for hope, growth and success for the most Americans as opposed to any other form of government. Lane: That has always been America's draw--hope. When you come to America, you leave other countries where there is no hope, and you come here because there is hope. And like Mark said, we're getting to the point where we're getting ready to step off, and we're going to become a hopeless nation. And we don't believe in pork-barrel politics, either. We don't want to send people to D.C. to bring money back to Mississippi. Mayfield: They sure think it is. We've got a senator up there right now—Thad Cochran—who's just as guilty as anybody. He's probably the worst one up there in terms of pork-barrel legislation. Wade: As it relates to fiscal responsibility, you made the note that it's the purpose of Congress to bring money back. It is to do it in a responsible way. We're not against government for being against government's sake. We're in it for the purpose of providing the most good for the most people. Isn't it hard for people to be engaged in Mississippi with it being so conservative? Mayfield: I think if you're willing to get off the bench and get in the game, it's not hard. I was never involved in politics until I saw the direction we started taking with the bailouts, the stimulus, TARP, Obamacare--you name it--this endless, mindless overspending and over-borrowing. You all had some harsh words for Lt. Gov. Tate Reeves after the last session. I'm interested in your assessment of the rest of the session. Mayfield: We applaud (Reeves') stand on fiscal responsibility. He's right in line with the Tea Party on that. Tate Reeves drew a line in the sand on any more state borrowing this year. But we've got a problem with him on immigration. We have reason to believe he blocked the immigration enforcement bill. Wasn't it because the Mississippi Sheriff's Association, the Farm Bureau and other groups came out against it? Lane: Associations do not elect him; individuals go to the polls. But they're associations of job creators. Wade: We will come together with Tate on issues we're in agreement on. He did not come out with a blanket endorsement of the Tea Party's position on illegal immigration. At the same time, that doesn't remove our responsibility to fight vigorously for things we believe in. You're doing outreach with groups that haven't traditionally supported the Tea Party--African Americans, minorities. What parts of the Tea Party platform do you think resonate with those groups? Mayfield: Jobs and economic development. Things like giving voters a choice on where to send their kids to school. They don't have to keep sending them to a failing public school. We want to give them the option of sending them to a successful charter school or perhaps look at vouchers where they can send them to a successful private school. Wade: Our position on charter schools is incoherent as black people. We're sitting up here watching our kids be destroyed because our leadership says we're supposed to dislike private schools because they were born out of segregation. Well, what wasn't? Everything was segregated 40 years ago. Sorry to shut the men out of the conversation, but I wanted to ask Janis about the role of women in conservative politics and reproductive rights. Lane: I do not agree with the federal government supporting killing a preborn human. A child is a child from the moment of conception. The argument is: They've done it before, they'll always do it. That's probably true. My point is a nation should not support or condone the killing of anybody. Then you'll come around with what about capital punishment. Well, you know what, if you're on death row, you're an adult and you made a choice to be there. An innocent child in the womb does not have a right to make a decision because they haven't been born, yet. We're taking that right away from that child. But do you think there are too many male politicians telling women what to do with their bodies? Wade: This is about right and wrong. How is it that they find a cell on Mars, then there's evidence of life on Mars, but if there's a cell in a womb, it's not a baby? ... You don't have the right to kill. If that was the case, then they had a right to kill us as blacks. If it's just a matter of having enough votes in the Legislature to kill someone, then there's nothing wrong with it. Lane: I'm really going to set you back here. Probably the biggest turn we ever made was when the women got the right to vote. I was happily reading along and even about to give them a few (only a few, mind you) points for wanting to sound almost reasonable until I got to the point where Ms. Lane said she didn't believe that women should vote. Do these people expect to be taken seriously? Really? They also don't appear to have any idea that they are happily being used by the likes of the Koch Brothers who desire nothing other than to dominate the economy and decimate the middle class. Please, in the name of all things holy, unholy, and in between, tell me this is satire. Please! Please! Sorry, Knol. This would be real. I knew when you noted that Kim Wade would be weighing in that this would be nothing more than hilarity. But Ms. Lane took the cake. I didn't think that their retrograde, self-loathing thinking would be so blatamly on display, but it is. Sadly, it seems the Governor is listed among this ilk. What a shame. In the future, it would be great if you could use your platform to share your politics without setting women's rights back a century. I am speechless. "Because women have the right to vote, I am active, because I want to make sure there is some sanity for women in the political world." Ms. Lane, just with this one interview alone, you are single-handedly tearing down what you are trying to achieve. This is absolutely revolting. And hypocritical, since I'm assuming Lane feels she has the right to vote, just not the "mean, hateful women" whose opinions differ from hers? Speaking of oy! One critique: I find the opening to the article inappropriate. The expression is not "three rabbis, three opinions." It's actually always a variation of "three Jews, four opinions" or "three Jews, seven opinions," etc -- i.e. more opinions than there are people, not "as many opinions as there are people". The joke is about arguing even with oneself/always seeing multiple points of view. It's also about valuing debate. So, the use of the expression as an opener for this article is not an accurate representation of that particular adage - and, um, on many levels, not a good comparison to the Tea Party. It riles me that these people talk with pseudo-reverence about the constitution while wholly reviling the entire document. For example, in our constitution there is, according to numerous comments and analysis from the people who wrote it, a wall of separation between government and religion. However, these people firmly believe that our nation is based on christianity and government should be an extension of the christian church. They support legislating based on their religious beliefs - rejecting science and fact while stomping on the rights of others who do not adhere to their mythology. If you don't believe in abortion, don't have one. You have all the rights in the world to practice your religion the way you see fit as long as you don't harm another living, breathing person, but you don't have the right to force your beliefs onto others, especially by legislating your beliefs into law. Reject science all you want, but don't force our laws to be written based on your mythology. The worst part about the Tea Party is that they are mostly all worked up about things that don't actually exist. So, are these folks the products of Mississippi's "failed public schools" or the superior private or charter schools they advocate? And have they considered the possibility that the reason why public schools all too often are not as good as we want them to be is because generations of folks have abandoned them? Did y'all catch that the Ledger led their Buzz section today with this interview and her remarks about women. It's interesting that they went from their policy of not crediting or mentioning us whenever possible to actually filling space with our enterprise reporting. Times must be tough over there, but at least they gave credit where it was due this time. Tell the truth and get mocked for it! God made Eve outta Adam and it was Eve who listened to the snake. Girls are STILL listening to snakes today! I take it with her viewpoint on women that she would have no problem reverting back to the days of when she could be sold because women were only considered property. The most frightening thing in the world is ignorance in action and this woman shows she is a master at that skill. If she doesn't think women should be allowed to vote, then she should be stopped from entering a booth on Nov 6th. Funny that http://blogs.clarionledger.com/alexmc...">the Ledger is writing about this interview again -- and trying to figure out if the Times-Picayune made it go viral. No, the news cycle did. It went viral back in June/July when it came out as well. Then about a week ago, some national reporters found it and started tweeting it again, then several political blogs followed, and now it's blown up. Of course, that is all about timing -- during the election season with so many people talking about the "war on women." I appreciate the (female!) blogger linking it, though. 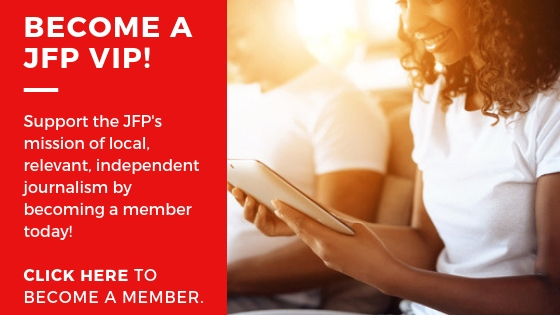 I guess they've lifted the ignore-the-JFP policy as many times as they've mentioned us in recent months. Hat tip. I'll also add that other stories we did, that were much more important, went big nationally but were ignored in the southeast and in Mississippi -- such as our 2008 reporting that Barbour was pardoning a series of men who had brutally killed wives or girlfriends. Ahem. I long ago learned that just because it isn't reported in Mississippi doesn't mean it's not news. Funny. Clearly because this story has gone viral internationally, Janis Lane now -- months later -- is claiming that was secretly recorded in the interview she did with Ryan with our photographer and her camera right there in her face. She claims that we are trying to "smear" her because we quoted her in a Q&A interview and that we're "liberal," coincidentally falling back on using a label that segregationists back in the day loved to fling--along with "communist" and "socialist"--on journalists or anyone in our state supporting the African American right to vote. Not saying there is a pattern here, though. "It is up to the Christian rednecks and patriots to stand up for our country." What if I'm not a redneck? BTW, is Ms. Lane a voter? She seems like a mean, hateful woman to me.